September 24, 2013: 200,000 Bangladeshi garment workers mobilise for three days in Dhaka and elsewhere calling for a living wage and strongly rejecting a derisory employers’ wage offer in negotiations. IndustriALL Global Union has long supported the calls of its Bangladeshi affiliates for a rise in the minimum wage for the sector in line with a living wage. The IndustriALL Bangladesh Council (IBC) is united in its demand for an urgent increase in the minimum wage to well over US$100 per month. Recent attention has focused on discussions inside the wage board created by the government to recommend an increased sector-wide minimum wage. IndustriALL has criticised the absence of a trade union representative on the wage board. One spark that ignited the mass worker demonstrations over the weekend however was the inadequate submitted proposal to this wage board from the BGMEA and BKMEA employers associations of 3,600 Taka per month, a raise of less than 20 per cent. Workers in the sector saw a prominent government cabinet minister this weekend supporting a raise to 8,000 Taka per month and directed their mobilisations’ anger in the industrial areas of Gazipur, Savar, Tejgaon, Ashulia, Mirpur, Uttara, Badda, Dhaka at the influential BGMEA and BKMEA as those blocking a significant increase. September 27, 2013: The Unión Obrera Sindical (USO), a Columbian trade union affiliated to IndustriALL, has just ended a 72 hour strike at the Cartagena refinery expansion project. The dispute ended on 23 September after a new collective agreement was signed. After almost 2 months of negotiations between the North American multinational CB&I (Chicago Bridge and Iron) and the Union Sindical Obrera (USO), involving lengthy rounds of negotiations and mobilisations, union leaders persuaded the company to increase its offer from $92 million to $104.5 million to cover a pay increase for the two year period in which the collective agreement will be in force. The agreement covers financial, trade union and political issues and includes substantial improvements in pay and benefits for employees. The agreement will also improve relations between the USO and CB&I Colombia. CB&I is the main contractor at the Cartagena refinery expansion project, the most ambitious infrastructure initiative that Colombia has seen in recent years, with an investment of $3,892 million. The project includes 12 new plants, which will increase capacity and make the refinery the most competitive in the Caribbean basin. The CB&I and Ecopetrol S.A. also agreed to pay the workers for the strike period, introduce a 45 minute meal break, provide Sodexo meal vouchers worth $200,000, pay a maximum of one hour per week overtime, extend benefits to employees of contractors and subcontractors and establish a formal relationship between the union and the project. The USO explained that a commission will be set up to review the dismissals that occurred during the dispute, with a view to reinstating the dismissed workers. The union stressed that the strike was peaceful and that workers followed union orientations at all times. IndustriALL thanks the national and international trade union movement for the support it has given to USO and congratulates the union for the unity and solidarity displayed during this dispute, which culminated in a victory for the workers. “IndustriALL Global Union salutes this victory, which will certainly strengthen not only the USO but also the initiative to create a strong union in the mining and energy sector, with the merger of USO, SINTRAELERCOL and SINTRACARBON”, said Jorge Almeida, Regional Secretary for Latin America and the Caribbean. September 27, 2013: IndustriALL Global Union conveys staunch support to USW Local 8565 fighting for a decent employment contract at ThyssenKrupp’s Rotek subsidiary in Aurora, Ohio. Rotek Incorporated is the North American leading manufacturer of slewing bearings and a market leader for seamless forged steel and non-ferrous metal rings. 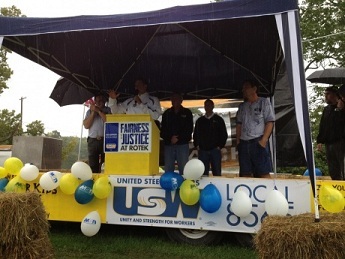 On September 21, 2013, the 100 plus members of United Steelworkers Local 8565, on an unfair labor practice strike at Rotek, were joined in Solidarity by Steelworker locals and others in the community. An estimated crowd of 300 braved a constant downpour. The crowd was addressed by USW local members, USW District Director Dave McCall, Ohio State AFL-CIO President Tim Burga and US Congressman Tim Ryan among others. ?? In addition, a staggering list of international support letters were acknowledged and read to the crowd. The members of Local 8565 also participated in a local parade that morning. The route of the parade went through downtown Ravenna that had over 20 local businesses showing their support for the workers at Rotek in their fight for fairness and justice. “We strongly deplore the company’s failure to resume negotiations with the union and meet the legitimate demands of the workers. Furthermore, we condemn the company’s attempt to resume production by hiring temporary replacement workers. Concessions are being demanded of employees more and more frequently. Employees are repeatedly asked to pay the price for the difficult economic situation. These circumstances are unacceptable. It must be understood that the employees are not at fault – on the contrary, business success is impossible without them. We demand that ThyssenKrupp’s Rotek subsidiary immediately resumes negotiations to find a mutually agreeable resolution of the labor dispute. September 26, 2013: In the wake of the industrial accident at the Freeport-McMoran’s Grasberg copper mine in Indonesia, trade union delegates travelled to the region on a solidarity mission in September. In May the roof on a non-operational underground tunnel collapsed during a training session at the Freeport-McMoran’s Grasberg copper mine in Indonesia killing 28 miners. The accident, which can only be described as industrial homicide, killed 28 mineworkers, all members of CEMWU FSPKEP-SPSI. 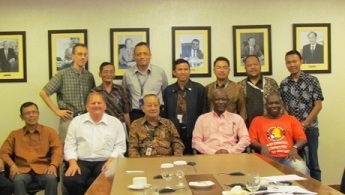 On 15-18 September, Andrew Vickers, chairperson of the mining sector at IndustriALL Global Union and General Secretary of CFMEU in Australia, led a high-level global solidarity mission to Indonesia to lend international support to CEMWU FSPKEP-SPSI. The mission included delegates from the United Steelworkers of America and the National Union of Mineworkers in South Africa, and was accompanied by IndustriALL Global Union’s Director of Mining, Glen Mpufane. During the three days, the mission delegates met with the management of PT Freeport Indonesia, as well as government representatives from the Ministry of Energy, Natural Resources and Minerals, and the Ministry Manpower and Transmigration. An investigation into the accident has been held, and from which CEMWU (FSPKEP-SPSI) was barred from active participation. The findings of the investigation could not be made public even though the report was not classified. This has led to a lawsuit being filed against the company by a human rights lawyer in Indonesia, although compensation has been paid to the families of the victims. “We learned with horror that the cause of the accident was that the roof collapsed due to faulty lines along the rooftop and deterioration of ground support bolts, and as such no one could be held accountable,” Andrew Vickers says. The mission’s conclusion, supported by the CEMWU FSPKEP-SPSI, was that the cause of the accident was management negligence. No evidence of inspections or risk assessment performed before the accident could be provided. “The mission also concluded that the accident clearly illustrates the urgent need for the ratification of ILO Convention 176 in Indonesia. IndustriALL Global Union is committed to lend our support to speed up this process,” says Glen Mpufane. September 17, 2013: The subject of organizing was on the agenda of a workshop for trade union leaders from Mexico, Central America and the Caribbean this week. 21 participants from Costa Rica, Guatemala, Honduras, Mexico, Nicaragua y the Dominican Republic participated in a workshop held in Mexico City on 23 and 24 September 2013. 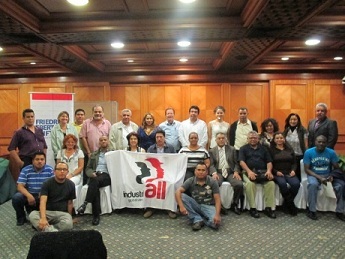 The workshop, organized by IndustriALL Global Union with the support of the FES, examined organizing methods and principles. Facilitated by Jeff Hermanson, the seminar looked at ways of winning majority support in an anti-union environment. Through exchanges of concrete experiences, the participants delved into challenges faced, campaigns won and lessons learned in their different countries and different sectors. The workshop, which is part of a series of FES workshops carried out in different continents, is in line with one of the major planks of IndustriALL’s action plan regarding strengthening union power through membership growth and the development of strong, independent, representative and sustainable trade unions. The participants also took the opportunity of their stay in Mexico City to express their solidarity with striking teachers. Addressing the teachers at their encampment at the Plaza de la Revolución, Assistant General Secretary Fernando Lopes told them their struggle against reforms was fair and important.